I saw the most beautiful, white garden the other day in Lexington, Kentucky. It was inspiring to put it mildly. I wanted to go home and plant white stuff in my little walled garden. The garden is so small that it is very easy to transform it into almost any color theme. A flat or two of annual bedding plants will do the trick. Of course, white, in and of itself, is not officially a color. Plants that have white blooms are actually just reflecting the full light spectrum back to us, and we perceive it as ‘white’. But most folks still consider white as one of the basic colors in our landscape. White themed gardens have been the rage since Vita Sackville West gardened in Sissinghurst, England, making such gardens famous during the middle of the last century. In early spring, our gardens are full of all manner of white flowering plants. Spireas are especially showy, and the Reeves’ spirea is premier among them. Of course, dogwoods stand out in our landscapes, both in our wild places and the highly maintained gardens, as elegant brides in their nuptial finery. In late spring, the large shrub Philadelphus will be blooming. Sometimes known as Mock Orange, its official name is Philadelphus coronarins. 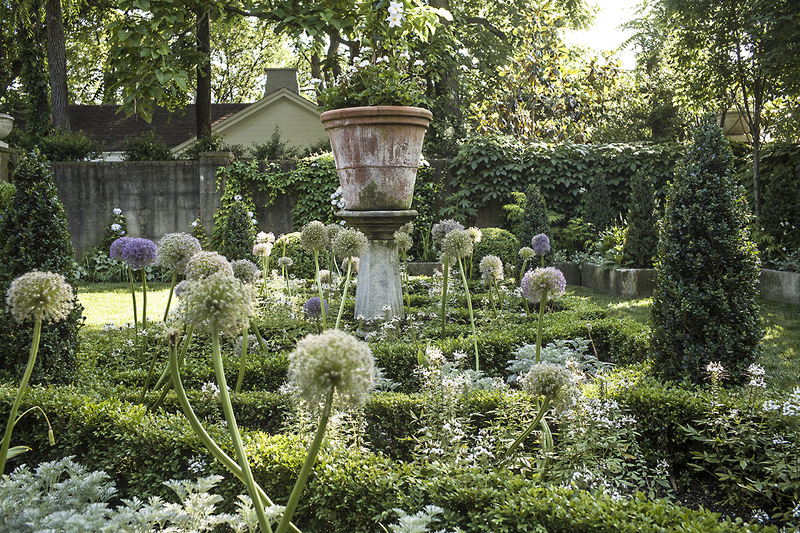 This shrub is especially sophisticated, exploding in a fountain of blooms. Give it space of about six feet so you can allow it to reach its full potential. This deciduous shrub is an old standby in Southern gardens and can be as dramatic as the dogwood; thus, one of its other names is the English Dogwood. Then mixed in among our brightly colored azaleas, the white flowered indicas like Fielder’s White and G.G. Gerbing add splashes of brilliance. But why not carry the theme throughout the rest of the year? Of course, lower to the ground, white blooming bulbs begin blooming in mid-winter- like the Tazetta narcissus, and Lucojum. “Cemetery White” irises will bloom later on . These irises often mark old cemeteries and home sites out in our countryside. They are tough, resilient and foolproof. Every Southern garden ought to have a few Cemetery Whites in it. You will either have to beg a few from a friend or find them along the roadside or around an old, abandoned farm site. They bloom in the spring , so mark where they grow and go back and dig them up later in the following fall and bring them into your garden. Fall is the perfect time of the year to reset Irises. Right now in our summer months, deliciously scented Milk and Wine lilies will push out trumpet-shaped, white blooms on tall stalks. Of course, there are other crinum that are not white flowered, but how can you pass by Milk and Wine lilies? Any plant named after milk would have to be on the list of great, white flowered plants. By the way, the wine part of the name comes from the fact that the blooms are often streaked a pale pink. Oh, and let’s not forget climbing plants. The white flower version of Lady Banksia rose blooms in the spring. And then there’s the wonderful French rose Sombrueii, which is an elegant, climbing rose perfect for a walled garden. Since we are talking about climbing plants, the little, white flowered cypress vine will add diminutive, white stars to your landscape, covering fences and walls in a single season. There’s more. Sweet Autumn clematis should be on the list of climbing plants. You see, there is no lack of white colored plants in this group, as well. Few white blooming plants can compare with the summertime blooms of the gardenia. There are few plants like it, for it brings not only white, cheery brightness but also a lush rich scent into our gardens during early, hot summer days. But don’t forget the magnificent crepe myrtle, Natchez White. In high summer, this tree produces plume after plume that glow in our landscape day and night. Few white blooming plants can compare to it, so don’t forget it when considering white in the garden. Oh, but let’s go on. Consider white Petunias in a sun-soaked bed or border with white bachelors button (gomphrena globosa). There’s the old fashion, white nicotina. You know, flowering tobacco. There’s the little, white sage (salvia coccinea) that sparkles in our garden, and then Datura arborea or Burmansia arborea , the witches flower that blooms at night. Have I mentioned white gardens are especially beautiful at night? 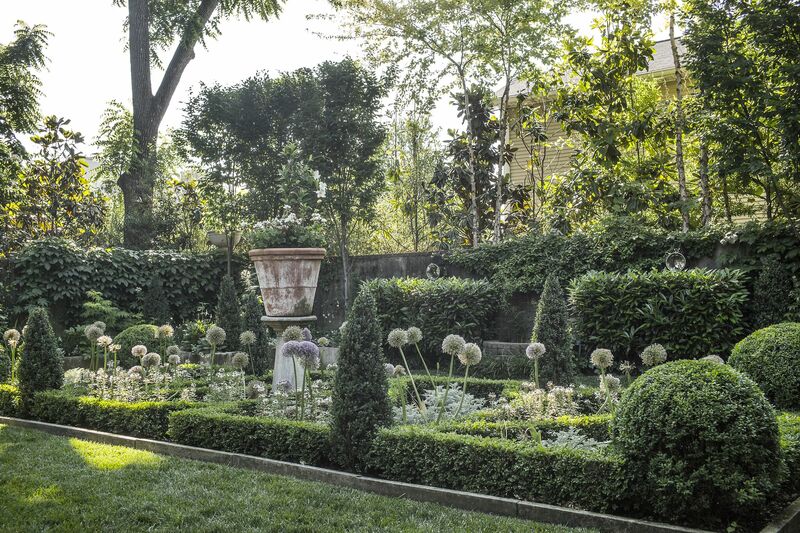 White may seem uninteresting to you as a color, but in the world of gardens, it’s not. You might want to consider more white in your garden. I think a full book could be written on white gardens. I would not be able to do such a book justice. I have such a small space to in which to experiment and garden, so a flat or two of annual bedding plants must suffice…and this simple column. The white garden in Kentucky that inspired me so. Sparkler White Spider Flower (Cleome sp.) and white ornamental onions (Allium sp.) The added clay pot with a white patina was perfect!